I’ve still managed to work on some projects this week as Mr C did all of the present wrapping whilst I was at work one day so I haven’t had to spend every evening making a mess with tape and paper. (He will definitely be on Santa’s good list for doing that job!) Instead, I’ve had a trip down memory lane, a play with glitter and ink and dug out an old WIP. This week it is my mum and my auntie’s birthday, so I’ve made two fairy themed cards for them. They are not quite identical cards because they are not identical twins! I used two shades of purple ink, layered until I was happy with the depth of colour, for the background. I then die cut two fairies from white card, and printed greetings which read ‘Have a fairy happy birthday’. The finishing touch was a lot of Nuvo glitter drops, which Mrs Cobs (of Cobweborium Emporium fame) sent me back in September. I was really happy with how they turned out! 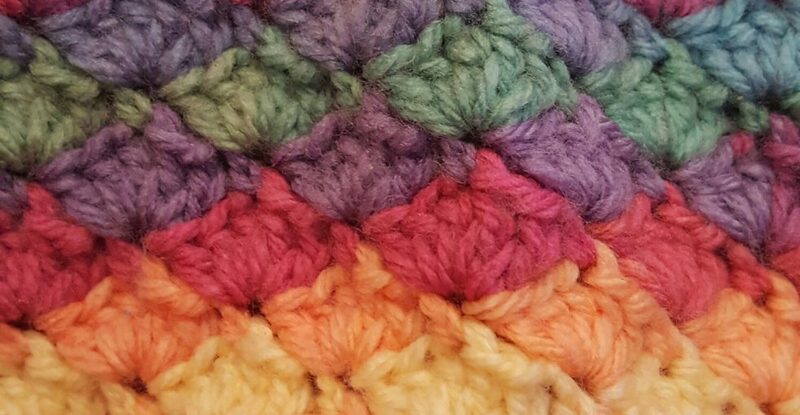 Because I have finished all of my other projects now, I dug deep in my craft corner and pulled out my bag with the yarn and pattern for my Attic 24 blooming flower cushion which I started in the summer. I’ve worked another 4 rounds (2 plain rounds and 2 petal rounds) and I’m still pleased with how it’s coming along. I’d really love to have this finished soon so I can use it! That’s all for now! Mr C is working loads over Christmas so I will have some time on my hands for working on my projects. I’d like to finish the cushion before I start any more new things. What are you working on? Are you hoping for any crafty items for Christmas? Love the cards. I made two of those Attic 24 blooming cushions a while ago for my granddaughters. Mine were made with bright rainbow colors. I like your more subtle color scheme. Thank you, it matches my room, I think they look lovely in bright colours too! Ohhh I SOOOO love that cushion! Well done, you clever thing. The Fairy cards are truly beautiful, and the backgrounds look like a whole lot of Fairy Dust has been sprinkled over the cards. LOVE the addition of the Tonic Drops. Great thinking. What am I working on …. well since I’m commenting on your blog and Mr.Cobs and my neighbour don’t follow you …. at least …. I hope they don’t because if they do I’m about to spoil some surprises…. I’m still working on an altered book, made into a card, for Mr. Cobs. (I was going great guns, but had to stop in order to pick up the slack on Christmas cards for neighbours and folks). Another project I have ‘on the go’ is a handmade gift, made by Mr.C and myself – a little wooden house which looks like our closest neighbours house. It took some designing, measuring, measuring again, designing again and then a teeny bit of guesswork …. but it’s now well on it’s way. I’m hoping that I’ll have it completed by Friday, so that I can wrap it and take it round to them on Saturday. My craft room looks like someone has tested a new paper bomb in there. I have this great big converted garage, with desks, and storage to the limit …. and over the last week I’ve ended up working in a decreasing in size area, until tonight I looked at my work desk as I went to leave and realised that I was now working in an area of roughly 15 inches square. Glue, scissors, tapes galore, gems, pearls, bottles of drops both glitter and clear, bits of paper, pens, rule, pencil, two rubbers (erasers for folks outside the UK), odd bits of ribbon, two reels of ribbon, and …. ohhh I could go on. Needless to say there is so much Christmas craft stuff strewn across the desks but … all I had to crafty Christmas buy this year was … A snowflake die and some Poinsettia dies. Everything else was in my Christmas Box. I have so much Christmas stuff that I truthfully think I won’t have to buy anything for roughly 8 years. (except cardstock). Thank you, have a wonderful Christmas. Those glitter drops were just perfect for what I wanted to do! Hopefully the cat isn’t out of the bag about the gifts that you’ve made. Amazing! Hand work and card making. Boy am I jealous. I do wish you a very Merry Christmas and an especially blessed New Year.. Thank you, I hope you enjoy your break and have a lovely Christmas! Cob is certainly a star! Sparklies!!! I love sparkly cards. I think you’re getting yourself into a colorful mood, what with the blooming flower. I hope you get it done, because it’s a fine example of tasteful 3D crochet. Thank you, I love a bit of well timed sparkliness! Love the cards! They’re very pretty. I’ve just started crocheting a hat, never done the pattern before so we’ll see how it goes! Thank you, good luck with the hat! Thank you, purple is a fail safe card colour! Hope you manage to complete all of your blankets, have a lovely Christmas. Fairy pretty crads and the cushion looks amazing. Thank you, the cushion has an amazing texture! Thank you, have a lovely Christmas! Thank you, sadly he is at work (retail-boo!) until almost new year now. You’ll have to book early for next year! The cards are really simple, best not to look at the backgrounds too closely but I have those mini cats eye type pads and I gently dabbed a couple of shades on to the cards until I liked the coverage and colours. It takes minimal skill lol but I like the effect! What a shame, I really could have done with some help when I was still going at midnight on Christmas Eve! Ah I only have the big rectangular ink pads, do you think it could work with those? I’m at my parents house for a few days so I can’t test it myself right now. Lol! I think the big ink pads might work, there’ll just be less precision over where the inked area is. I’d give it a go! Lol, hope you got them all done! I’m working on a list of little projects that I want to get off the to-do list!